Creates acceptance of the body and earth planes. Stabilizes and enhances feelings of security and safety. Promotes walking softly upon the Earth Mother and encourages our earth awareness and responsibility. Helps to accept one's place on the planet and heals fear, depression, addictions and obsessions. 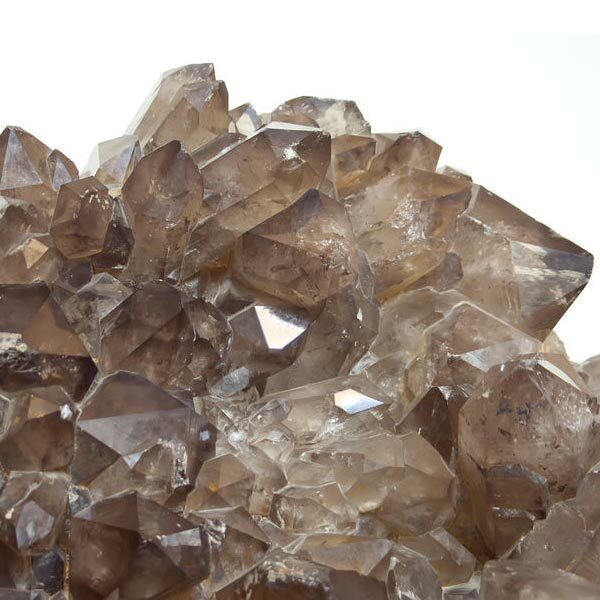 Smokey Quartz has a trigonal crystal system and is in the mineral class of oxides. It's smokey color comes from the traces of aluminum, lithium and the influence of radioactivity lodged between the layers of its structure. Like most quartz, it is formed hydrothermally, mainly in hollows that have been formed by gas bubbles in ancient volcanic rock. It is most commonly found in the Alps where there seems to be a relationship between the elevation of the source and the darkness of the crystals. Smokey Quartz works best when worn where the crystals are in touch with the body. 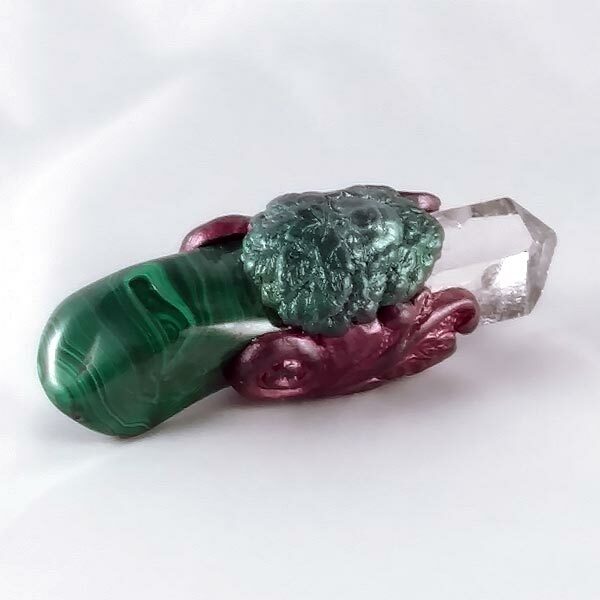 In situations of stress, try holding two polished or rough crystals (one in each hand) and relief should follow. To assist in dissolving pain, crystals may be laid directly on the part of the body that is affected. 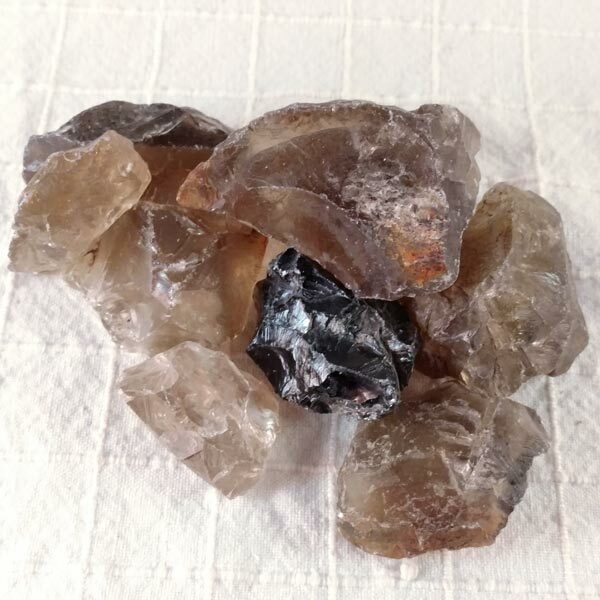 Smokey Quartz increases our tolerance of stress and is a good crystal for many. It can assist in bearing sorrow, in producing great effort and to cope with hard times. It can assist you in the work that needs to be done. Smokey Quartz has a relaxing effect. In the long term it will assist in taking away the tendency to allow ourselves to be stressed and will help make us more resistant to stress factors around us. 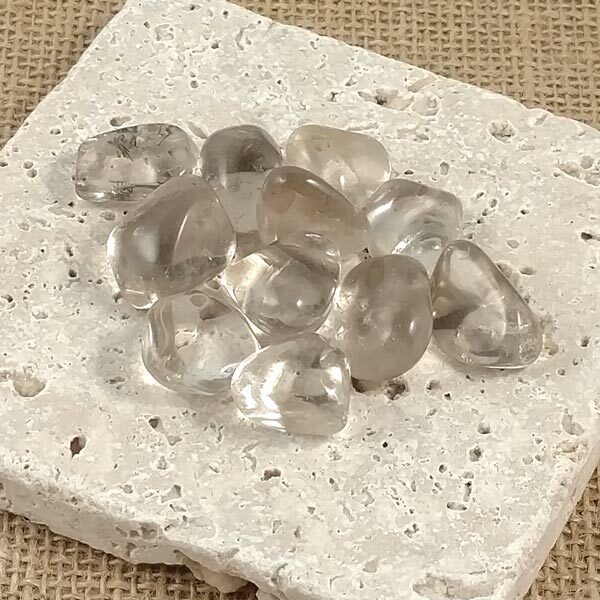 Smokey Quartz encourages us to have realistic and pragmatic considerations. It encourages concentration by dissolving contradictions and helps to separate feelings and thoughts. Smokey Quartz has a pain relieving effect. It has been shown to be helpful with back problems and womens cramps. It fortifies the nerves and has been found to be a great asset in easing the effects of radiation therapies and the damage caused by it. Smokey Quartz has affinities with all signs of the zodiac. It is helpful to those in high-stress occupations, natural healers and exterminators. It has a Receptive Energy, its Planets are the Sun and Moon and its Elements are Fire and Water. Smokey Quartz is considered to be a protective stone. In Alpine countries, even today, crucifixes are still being made from Smokey Quartz. Soldiers from many different armies have marched to war wearing this as their protective stone with the belief they would return unharmed from their battles.